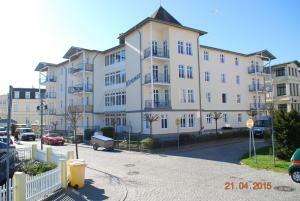 Miramar-App-06 is a holiday home located in Ahlbeck, 100 metres from Ahlbeck pier. The unit is 200 metres from Local-history exhibition about Ahlbeck pier. The kitchenette is fitted with a dishwasher. A TV is provided. Payment before arrival via bank transfer is required. The property will contact you after you book to provide instructions. Guests are required to show a photo identification and credit card upon check-in. Please note that all Special Requests are subject to availability and additional charges may apply. Please inform Miramar-App-06 in advance of your expected arrival time. You can use the Special Requests box when booking, or contact the property directly with the contact details provided in your confirmation.